Weeks 4 & 5 Updates. Fishing a little slower but still good! Fishing gets even better and the food oh my! Note: This 20% discount applies to all adults in your group, so if you have a military friend, take them fishing and save a bunch yourself! To qualify for the Military discount we require a DD-214 form. Type in your email to sign up for our newsletter. Don't worry we don't share your email with anyone. Cabin 3 with a beautiful view of the third narrows on Wabaskang Lake. Cabin 4- With a huge wrap around deck to the South, a great view and a great spot to catch some afternoon sun. Individual twin beds in all cabins. No bunk beds! The cleanest fish house in Canada! Remote as we are on Wabaskang Lake, and with the highways far behind you, you will enjoy many of the amenities of home you would not expect in the wilderness. Your cabin rental will come complete with electricity 24/7, hot and cold running water, flush toilets, and a hot shower in your cabin at the end of a great day of fishing. Whether you are planning a trip for a group of fishing buddies or plan to bring the family, we are confident you will be pleased with the cleanliness of our accommodations and top flight customer service. As you enter your cabin, you will notice the care that was used in preparing it for your arrival. Everything will smell clean, look clean and BE clean. 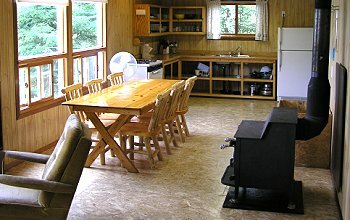 Your cabin rental will come complete with all your bedding, dishes and cooking utensils, a full size propane stove for all your cooking needs, a refrigerator for all your perishable food items, a wood burning stove for those cool nights or mornings (we keep your wood box in your cabin full for you), flush toilets and a hot shower. Electricity is provided 24/7 via generator with a back up generator on site. Family vacations are best in July and August. The weather is generally warm and dry, and yes you can swim in Wabaskang Lake this time of year. The kids can enjoy swimming off the dock (we provide the ladder) or one of the sandy beach areas around the lake, volleyball, soccer, badminton, and many other games we have in camp. Softball games have been known to break out in camp on the lower lawn when kids are in camp too. Eight guest cabins are located in camp and are available for your group. 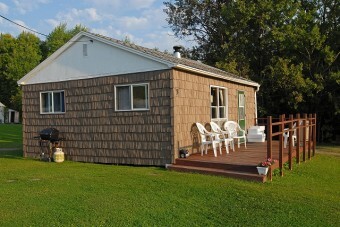 Each cabin rental provides its own unique view of the lake, and has its own private deck and gas grill. The camp also has a separate shower house facility with two additional 3 piece baths which can be used as an overflow for your group’s convenience. As remote as we are, there is telephone service available to guests in camp AND although we have no roads around camp for you to listen to the highway traffic, we DO have wireless internet access available at no charge. 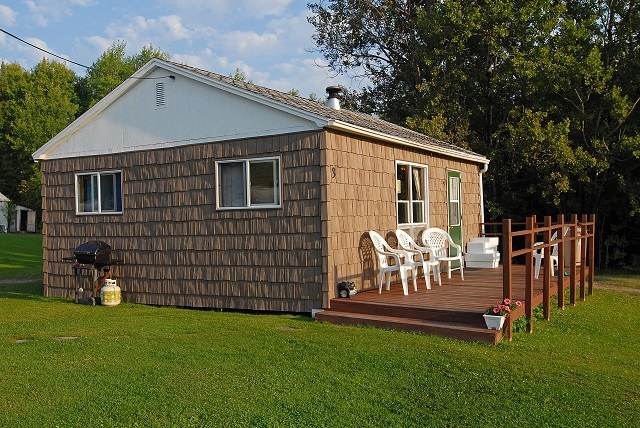 Little 7 – Sleeps 2 (single room) Enjoy this quaint and cozy one room cabin at a reduced rate! Each bed is a twin size, single bed that comes complete with comfortable mattress, box springs and all bedding and pillows to ensure a comfortable nights rest. Little 7- Is also used as “overflow” for our 8 person bookings and is provided at a reduced rate whether booked as a stand alone cabin or as a part of a larger group..
Peffley's Wilderness Camp is a family owned and operated camp. 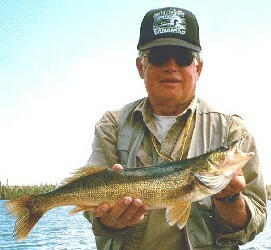 Dave has been fishing Wabaskang Lake for over 25 years and was previously a guest of this camp for 12 years prior to purchasing the camp in 2005. I am a proud supporter of our military and offer a nice discount during the month of July to our guests who have also served. 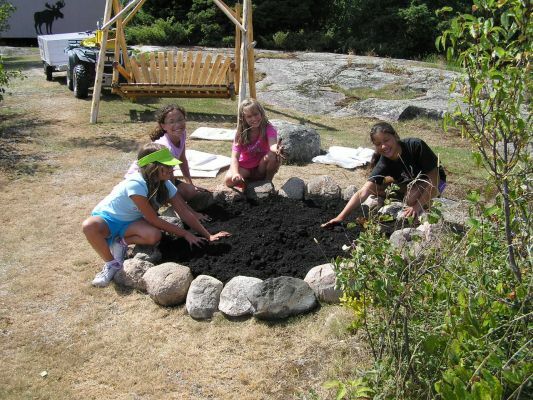 I have three daughters ranging in ages from 16-21 who spend much of their summer with us in camp and have totally embraced the wilderness experience we offer. They have for years referred to it as the "best summer experience ever". 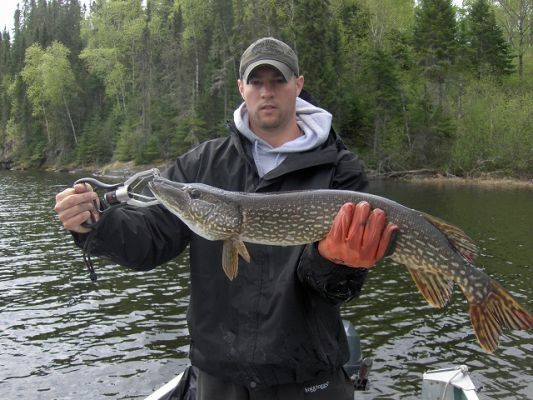 While rarely necessary on our lake, because I do have a very good working knowledge on how and where to fish on Wabaskang Lake and our portage waters, I will guide groups if asked to. Otherwise, I am always happy to share information with our guests and provide them well marked lake maps so they can start catching fish their first day in camp. I pride myself on running a very clean and well managed camp with your satisfaction our top priority. Many guests who have fished from this camp for over 20 years, and several more that have fished here for over 30 years and even some over 40 years. the roadside landing during our operating season. on Saturday mornings (changeover day).